The Kingfisher/Umiak series has been in production since 1989. We've built hundreds, and most operate in very harsh environments. Major upgrades were incorporated into the design and construction process in 1994. These improvements are very successful, and a major breakthrough in Naval Architecture. Through this, MCM developed a much stronger and lighter hull by increasing the thickness of the plate and frame while reducing frame spacing and thickness. The by-product of this lighter/stronger hull is significant. It requires less horsepower and fuel to drive it and has a much higher cargo capacity. 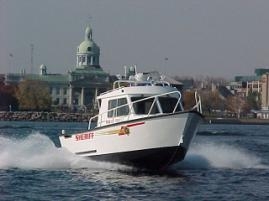 It can achieve very high speeds due to reduced hull flex. In strength of these boats is amazing. We have used the boat in 3” of ice, and it can be beached onto rocky shores or cement ramps. To better facilitate this we have incorporated a standard heavy duty grounding bar/keelson which provides significant protection for the hull and provides much greater directional stability for the craft. 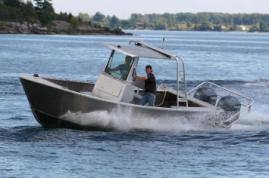 The Kingfisher 28 Patrol Boat.